This little lunchbox of mine has been traveling this past week to football and soccer fields. 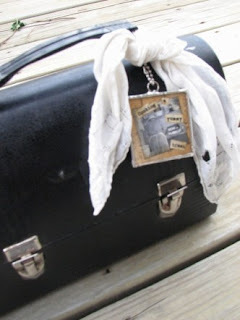 It doesn't carry snacks, but it does carry some yummy goodies to create some Silver Bella Swap Magic. So if you see this around, you will now that I am cooking up some wonderful treats to swap a Silver Bella. Only 7 more weeks to go and a few more sweet treats to make! Can't wait to see the treats that come from your lil' lunchbox! Oh how fun that you take your supplies to games to work there! and it is carried in such style too. What a cute way of transporting your supplies!I am almost done with my Sb swaps. It's almost heeeereee!! !BTW, I LOVE all of your fall creations in the last post! !